It occurred to me, as I walked along a local river bank with a friend a couple of weeks ago, that anyone under the age of about 30 probably has little idea why ecologists make such a fuss about Himalayan balsam (see The Politics of Pests). I was explaining how different this place was now compared to when I first visited but for her, the pink flowers of Himalayan balsam were something that she always associated with river banks. Himalayan balsam was as much a feature of the British countryside for her as rabbits – introduced here by the Romans. I also wrote recently about the barriers that public perceptions create (see “To Constable country, via a blog on fracking …”). Environmental improvements are expensive and we need to justify expenditure yet, with the passing of time, Himalayan balsam and other invasive plants will become part of people’s experience of rivers, not as intrusive aliens. Their impact on the native vegetation will be something that only a few specialists appreciate. There is, in fact, a big literature on how public perceptions are important in environmental management, but this has an inherent limitation as even our earliest memories do not extend far enough into the past to give reliable insights into the natural state of lakes and rivers. In theory, of course, applying the scientific method allows a more objective, less biased evaluation of what we mean by a “natural” ecosystem. But we ignore public perception at our peril: the case for environmental restoration beyond a state that lay people regard as desirable will need to be made very clearly in order to justify the costs. An absence of Himalayan balsam is not, itself, a benefit that a lay person will automatically appreciate. Himalayan balsam growing beside Smallhope Burn, a tributary of the River Browney, near Lanchester, County Durham. I end this short thread of posts about Himalayan balsam on a pessimistic note. The river banks we were walking around were part of a country park managed by the local council. Their budgets have been cut so much that the prospect of manual control of Himalayan balsam is out of the question. Indeed, there is so much Himalayan balsam that any effort to remove it from a single location would have to be an ongoing campaign as it would constantly re-invade from outside. It may be possible for Wildlife Trusts to marshal volunteers to keep Himalayan balsam at bay on nature reserves, but the co-ordinated regional and national control programmes that I mentioned in The Politics of Pests belong to the world of fantasy, not reality. I have seen the future … and it is pink. Valinia, S., Hansen, H.-P., Futter, M.N., Bishop, K., Srisskandarajah, N. & Fölster, J. (2012). Problems with the reconciliation of good ecological status and public participation in the Water Framework Directive. Science of the Total Environment 433: 482-490. 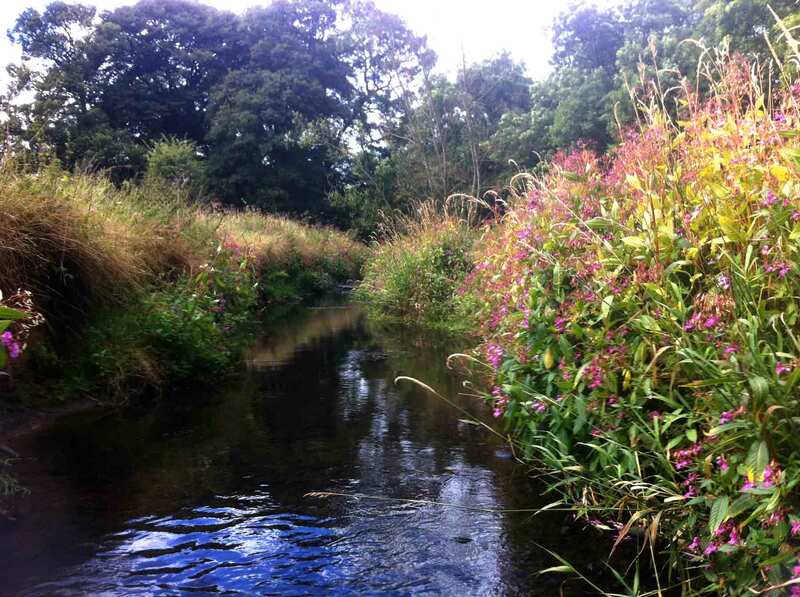 This entry was posted in Uncategorized and tagged control, Himalayan balsam, invasive plants, water framework directive. Bookmark the permalink.